Much of the writing on the post-9/11 period in the United States has focused on the role of "official" Government rhetoric about 9/11. Those who have focused on the news media have suggested that they played a key role in (re)defining the nation, allowing the citizenry to come to terms with 9/11, in providing `official' understandings and interpretations of the event, and setting the terms for a geo-political-military response (the war on terror). However, strikingly absent from post-9/11 writing has been discussion on the role of sport in this moment. This text provides the first, book-length account, of the ways in which the sport media, in conjunction with a number of interested parties - sporting, state, corporate, philanthropic and military - operated with a seeming collective affinity to conjure up nation, to define nation and its citizenry, and, to demonize others. 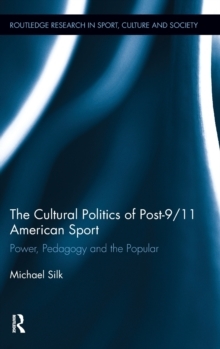 Through analysis of a variety of cultural products - film, children's baseball, the Super Bowl, the Olympics, reality television - the book reveals how, in the post-9/11 moment, the sporting popular operated as a powerful and highly visible pedagogic weapon in the armory of the Bush Administration, operating to define ways of being American and thus occlude other ways of being.